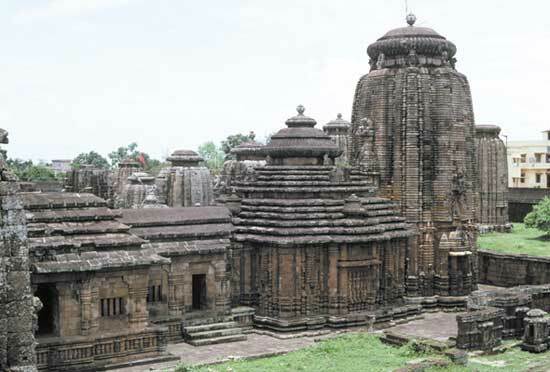 Bhubaneshwar the capital of Orissa is a city of temples, several of which are important from an architectural standpoint. The Lingaraj temple - the largest of these is about a thousand years old. Bhubaneshwar, Konarak and Puri constitute the Golden triangle of Orissa, visited in large numbers by pilgrims and tourists. This 180 feet high grand temple is dedicated to Lord Shiva and is considered to be the finest example of purely Hindu style of temple architecture. The Lingaraj Temple has a jagamohana, natamandir, bhogamandapa and is surrounded by a massive 7 feet thick wall. The temple's spacious courtyard is filled with more than 100 shrines. The sculptures in this temple date back to 1014 AD to the Somavamsis. Inscriptions from the period of the Kalinga King Anangabhima III from the 13th century are also seen in the temple. Lingaraja Mandir - the great temple of Bhubaneswar. From the 8th to the 13th century more than 2000 temples were built around Bhubaneswar. Today, about 500 remain but only a fraction of these are of great interest. According to a custom, pilgrims who wish to go to the Jagannath temple at Puri, must first offer worship at the Lingaraja temple. Bhubaneshwar is also a revered pilgrimage center, referred to in the Bhrama Purana. The Bhrama Purana refers to Bhubaneshwar as the Ekamra Kshetra enshrining a crore Shiva Lingas.